Connecticut Commentary: Red Notes from a Blue State: Suzio: "Lawlor Illegal Member Of Victim Advocate Advisory Committee"
Suzio: "Lawlor Illegal Member Of Victim Advocate Advisory Committee"
Former State Senator Len Suzio, Connecticut's leading critic of the Early Release program, said Mike Lawlor should not serve on the Victim Advisory Committee because of his role in advocating for the Early Release of violent criminals from Connecticut prisons. 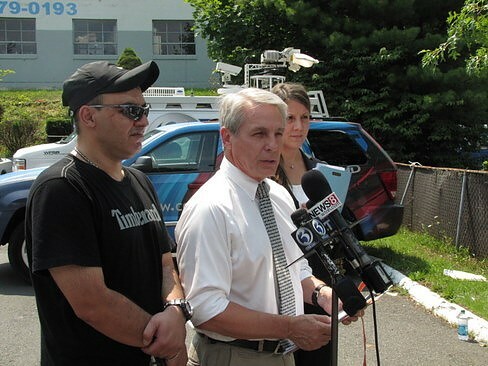 Also, Connecticut law makes him ineligible for membership – “he never should have been appointed by the Governor in the first place”, Suzio said. "The Early Release Law, of which Mike Lawlor is the chief architect and defender, is an outrageous violation of the rights of crime victims and their families. Under the Early Release law, thousands of violent criminals have been released or discharged prematurely from prison, free to maraud and free to murder innocent citizens and free to terrorize their victims," said Suzio. Suzio stated that State law prohibits Lawlor from serving on the Committee. "The legislature intended the Office of Victim Advocate to be an 'independent' office and explicitly states, 'the Victim Advocate shall act independently (emphasis added) of any state department in the performance of the Advocate's duties' (see Section 46a-13(b)). The statute is very clear, 'No member of the advisory committee shall be a person who is a volunteer for, a board member of, or is employed by any entity or agency subject to the review of, or evaluation or monitoring by the Victim Advocate . . .' (Sec. 46a-13h) Clearly Mike Lawlor runs a division whose policies and practices have a history of being criticized and objected to by the Victim Advocate. In fact, Mike Lawlor used his role on the Advisory Committee to effectively fire previous Victim Advocate, Michelle Cruz, who had independently criticized Lawlor's Early Release law as an abuse of Victims' rights. That is why I call upon Mike Lawlor to resign from the Committee today" Suzio said. "I also call upon the Advisory Committee to hold public hearings on the process by which a new Victim Advocate will be selected. Thousands of Connecticut crime victims and their families are served by the Victim Advocate. They should have a say in how the most highly qualified candidates for Victim Advocate are determined. We need to assure that only the most highly qualified and independent person is hired to represent their interests. Len Suzio is a member of the Victim Advocate Advisory Committee. "The accumulation of all powers, legislative, executive, and judiciary, in the same hands, whether of one, a few, or many, and whether hereditary, self-appointed, or elective, may justly be pronounced the very definition of tyranny" (James Madison, Federalist No. 48, Feb. 1, 1788). It seems that this is the norm lately in CT. I have asked Governor Malloy and the attorney general George Jepsen to review an issue involving the Office of State Ethics and their Citizens' Ethics Advisory Board and their incorrect application of a statute and the terms of the Code of Ethics. They brought ethics charges against me under Chapter 1 Volume 10 of the Code of Ethics charging that I was a state employee by definition under I-79 m which defines a "state employee"-who can by statute be fined if a violation is found-problem is that I did not fit the definition of a state employee under the code, nor a lobbyist or public official. No matter they conducted their puppet show with two board members (one being Shawn Wooden now challenging Eric Coleman for his Senate seat) who was ineligible to be seated. He resigned after voting but failed to state that he was ineligible to vote or to address the issue which he was aware of -that according to the statute since 1979 (P.A 79-493) I should not nor could not legally have been brought before this body. Nor could a penalty under I-88 a (3) be imposed against me if I did not fit the definition according to I-79 of "state employee" lobbyist or public official by statute.The fact that the OAG under the former AG Richard Blumenthal with held exculpatory evidence vital to my defense until after the hearing concluded which would have exonerated me only added to my disappointment in CT leadership. I have yet to hear from Governor Malloy on this illegal application of a statute nor from Mr.Jepsen on the actions of his office prior to him taking his oath and the actions of the OSE and CEAB. When Mr.Jepsen took office he then complied with the long pending Freedom of Information request and released the document with held by his predecessor. The CEAB and OSE said too bad, we won?? Maybe Senator Suzio will be more successful seeking their attention. For me, I am still waiting to see if our governor cares how the OSE and CEAB function or whether our attorney general will turn a blind eye now that it has been brought to his attention again. May be they are all too busy with their upcoming re-election campaigns. Hopefully at least the voters in Hartford will have an opportunity in August to question Shawn Wooden as to what was he thinking sitting on a board when he was ineligible and why he sat silently while a grave injustice was carried out and he cast his vote with this body. Maybe ethics is not important to him either or the intent or meaning of our state statutes.